“Only through Christ’s Word did they have success”. Fishing…I remember going to Silverwood Lake when I was a child, and all I could remember is that we caught absolutely nothing. We went several years in a row, my brothers and I, we camped, we fished, but never did we catch anything at all. We tried our best too. Getting the proper equipment, bait, and even having patience, sitting, watching and waiting, hoping that we would just get a nibble, but to no avail. Unsuccessful. Maybe we were trying too hard, trying to force the issue, just hoping our diligent effort would result into a catch. The disciples went fishing and they too caught nothing. But then, the resurrected Lord stood from the shore, saying, “Cast the net on the right side of the boat, and you will find some”. By the Word of our resurrected Lord, the catch was a miracle! I think for all of us, sometimes we make evangelism seem like such a difficult task. What words do we say? What if they ask a question that I do not know the answer to? What if they reject my witness? So bogged down we get, that we become discouraged and fearful of any evangelism encounter. But the biggest pitfall for me is when we think we are doing the work. That we are bringing something to convince someone that this Gospel is true. That we need to bring eloquent words in order to present the Gospel perfectly. Of course, doctrine is important, but the greatest pitfall is that we try to catch fish on our own. And that is never the case. Remember this is the resurrected Lord commanding His disciples to cast the net on the right side of the boat. 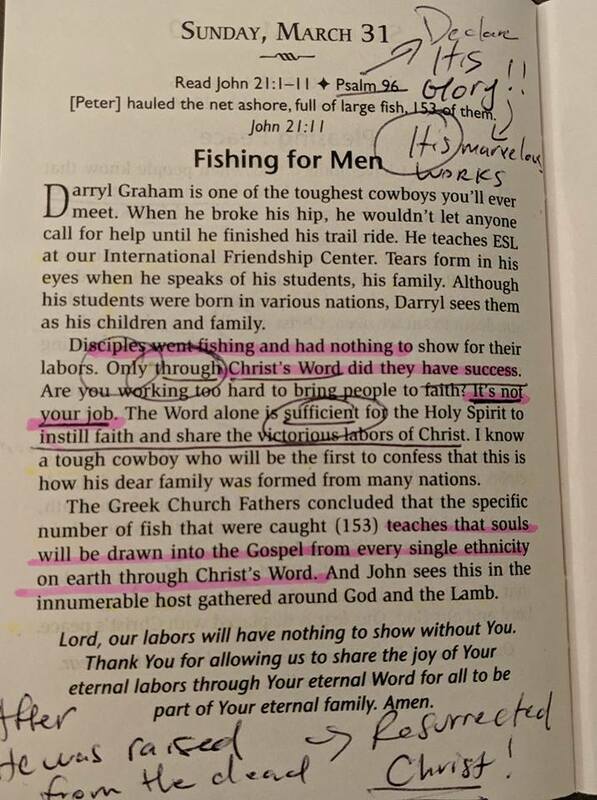 It’s a reminder to us all that fishing for men is God’s Word. I love how the author says, “its not your job”. Because this is so true. When we confess the Art III of the Apostles Creed, “I believe in the Holy Spirit”, it is the Holy Spirit who works through the “Word alone” which “is sufficient for the Holy Spirit to instill faith and share the victorious labors of Christ”. Isn’t that the meaning of the Art III, that we cannot by our own human reason or strength come to Him? And if we know that it is the Holy Spirit who creates, sustains and keeps everyone of us in the true faith by this very Word, we know who is working. And thus we trust in the power of God’s word. If they reject, it just isn’t the time and that’s okay! It’s not your job “to win” them over. But until then we pray for them constantly. Pray for you field. Pray for the Lord to open your eyes to your field so that you are prepared to defend the hope that is in you. Pray for those people specifically in your life that need to hear and receive this Gospel. Bring them to church or if they need a visit from a pastor, I’m here! Always! So let your witness be one of good news and great joy! Because it is! You and I have the greatest remedy in our Lord Jesus Christ. Our Savior who has set us free, rescuing all of us from sin death and the power of the devil. This is the greatest news. We have the cure for all the world, the greatest news! Who has God placed in your life? Maybe it’s a family member, neighbor, a friend, co worker, local clerk at the grocery store, even a barista. Continue to enjoy His word as you dwell, meditate and pray upon it all. For there, in this joy, you will “declare His glory…His marvelous works” [Ps96]. After all, it is the Lord’s job, His Word is sufficient. Remember the movie “Arachnophobia” with John Goodman who was battling a barn infested with deranged spiders? As a child that movie struck great fear for the arachnids in my life. To this day, I still fear all creepy crawly things..ie spiders, lizards, mice, snakes etc. How about you? What do you fear? From our daily standpoint, it might be that unexpected bill in the mail, or the uncertainty of financial security. Others may fear the unknown of what the future will bring, or the constant chaos of wars and violence plaguing the world, but whatever it is, many would say that what is most feared is death. Romans 5:12 “Therefore, just as sin came into the world through one man, and death through sin, and so death spread to all men because all sinned”. So many times I would walk into Los Robles Hospital, and many strangers would stop me and discuss their struggle with the fear of death/affliction/suffering/pain. Because indeed, death [and all the rest] can be a very very very terrifying fear in anyone’s mind. And I totally understand their plight. “The Lord is my light and my salvation, whom shall I fear” [Ps27:1]. This is my go-to verse in the hospital setting. For the fear of sickness, affliction and death are all too real in our lives. 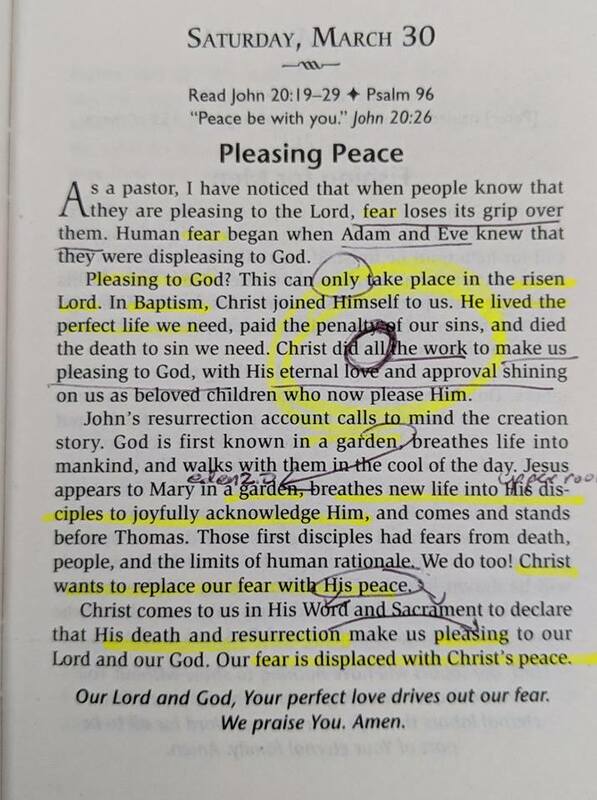 But when we pin fear against our Lord, Jesus dies the death of all deaths by way of the crucifixion, only to rise three days later to be our “pleasing peace”. When we reside in the promise of God’s Word in Holy Baptism, there we find our “pleasing peace”. When we partake of the Sacrament of the Altar, there too we receive our “pleasing peace”. “Take heart is I, do not be afraid” Jesus says. Because through all the moments of life that seem like an overwhelming avalanche that will never cease, there is our risen Lord, who says, “Peace be with you”. And yes, the devil will throw everything at you to distract and turn you from Christ promises, but remember, just as Jesus overcame the temptations of the devil in the wilderness, He ultimately crushed the evil foe on the Cross [Gen3:15]. Fear. Yes, there are many things we fear, but through it all, God is always with us. For His word points us to His gracious peace. “Fear not, I have redeemed you, I have called you by name and you are mine” [Is43:1].